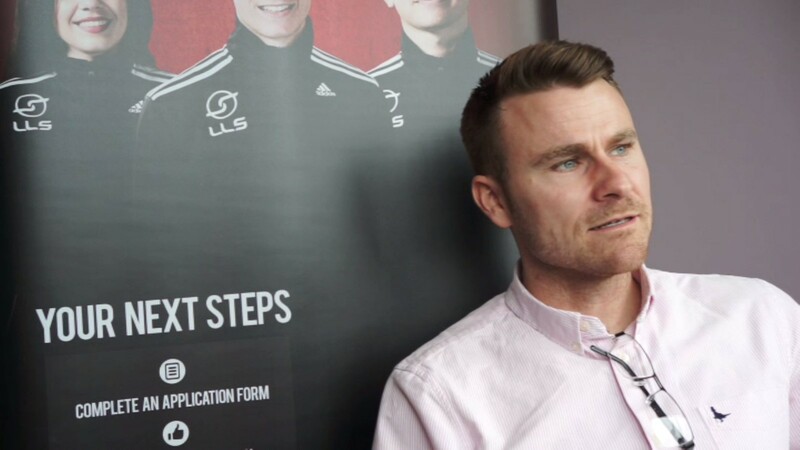 Tom Bates is a leading performance psychologist, speaker, author and UEFA A Licence Coach and has worked with teams in the Premier League and English Championship. 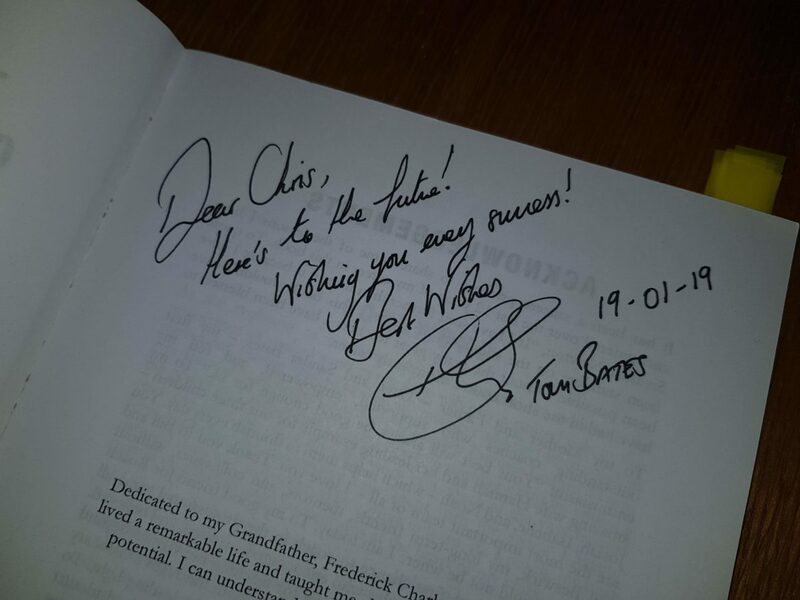 Tom released his new sports psychology book “The Future Coach” in 2018 which was one of my favourite books of the year. I would recommend all young coaches to read this book! I took the opportunity to listen to Tom talk about his coaching when he took his Future Coach Seminar to Dublin. 1. Why do you coach? 2. Why do you coach the way you coach? 3. What would it feel like to be coached by me? We were challenged to put ourself in our players shoes, what type of leader would you want if you were the player? Throughout the next hour and a bit we worked through a series of discussions, exercises and Tom shared his experiences which included a Pep Guardiola session at La Masia in Barcelona. “Success is the capacity for sustained effort in the face of setbacks”. All too often success is judged simply through the amount of games and trophies won. We should teach our young players that setbacks are an opportunity to learn, improve and be better prepared for the inevitable challanges. 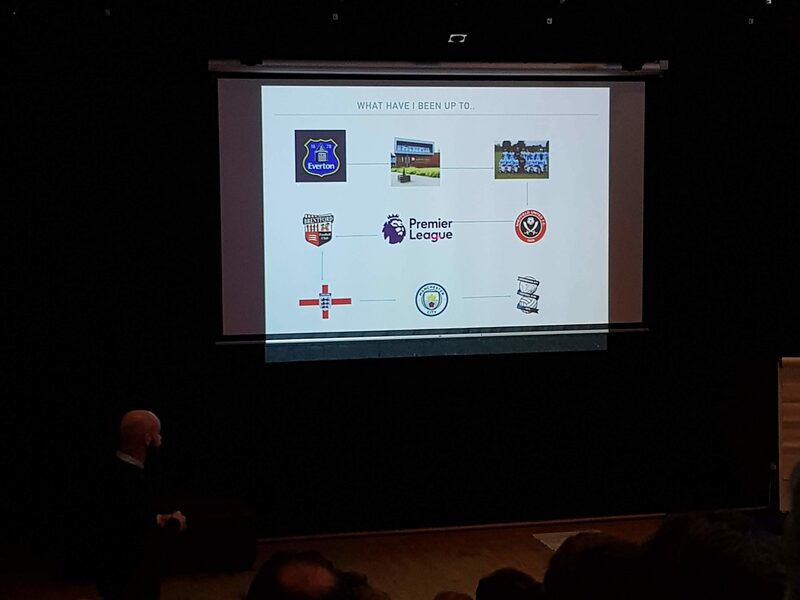 Next up was Lee Carsley, he took us through his journey from Premier League player to driving the bus for Coventry City Under 18s and then joining Man City Academy the same week Pep Guardiola joined the club. His honesty throughout the talk was inspiring. Not afraid to say when he wasn’t good enough, but was always prepared to work hard to get better at the job he was “obsessed” with. Lee’s message to all the coaches in attendance was to “constantly push yourself” and to “be the best at what you want to be”. One of the take away pieces from Lee’s talk was the process he goes through with his teams when he first comes into a job. First, through an initial presentation, he will tell the players what they can expect of him. He will give 100%, he will always be honest, be respectful etc. Next, he will communicate to the players what he expects of them. This process brings clarity to both parties, sets a foundation for everything to come and allows the players to see how hard working Lee is as a coach. A top class presentation from a coach currently working with some of England’s most talented players in the England Under 21s. 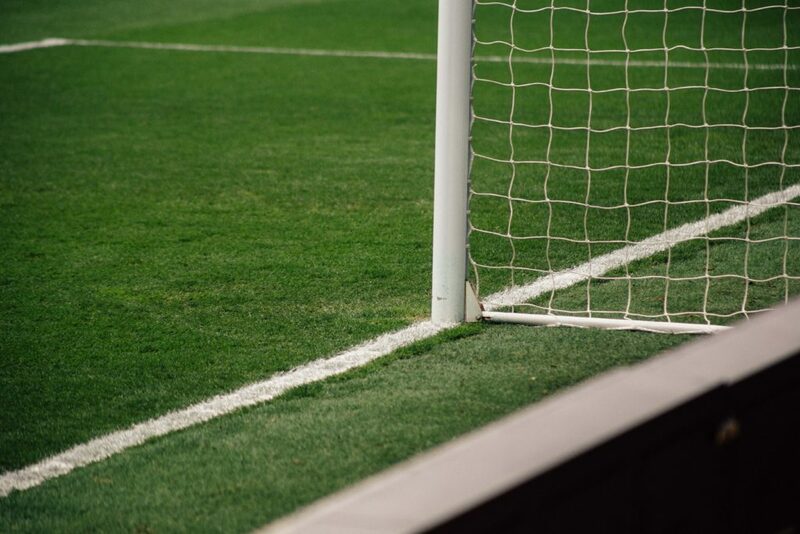 Being honest – I often thought of Sports Psychology as something reserved for elite athletes. 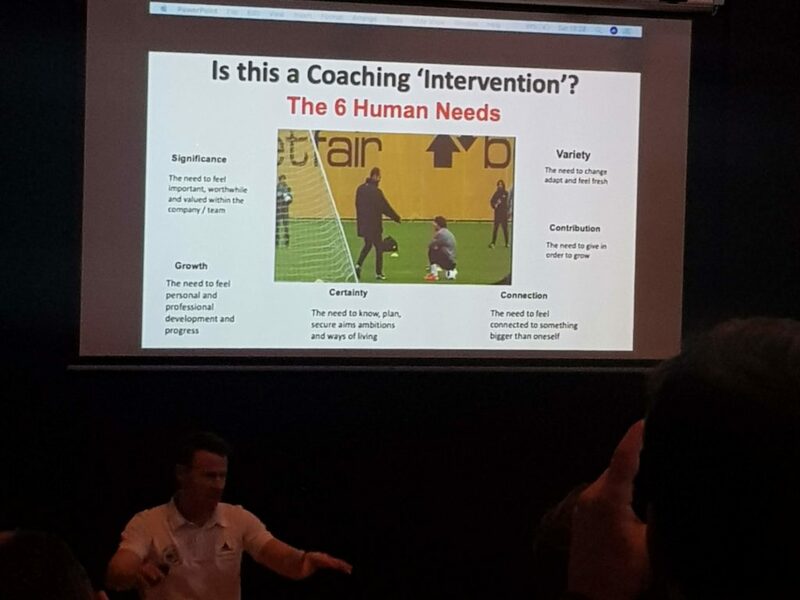 What I took from the Future Coach Seminar was that it doesn’t matter what level of the game you coach at, there are elements of sports psychology can play a key role in improving myself and the players that I coach. One of the main themes throughout both presentations was learning to deal with failure. It was clear from the experiences shared by Lee that his ability to deal with setbacks has made him in coach he is today. Having a high level of self-awareness is massively important for any coach wanting to improve and how you respond to setbacks is what will determine how far you go. This was a really enjoyable afternoon and I took lots of ideas from both Tom and Lee. If you haven’t already read the The Future Coach yet it is well worth getting and I found it an excellent introduction to sports psychology. This month on the Modern Soccer Coach Worldwide Mentorship Programme we have been looking at communication and how it is an essential tool for any successful coach. Following on from defining our Coaching Philosophy last month, the communication piece has been both challenging and hugely interesting at the same time. I have always tried to make a conscious effort to think about what I will say to players before a session, and to also about de-brief questions to ensure the players understand the session objectives. Same applies for match days, I would have a couple of simple points that I want to get across to the players pre-match, then we always de-brief at the end of the game. What this month has made me more aware of is that there are so many more opportunities to effectively communicate with players. Whether that’s general chit-chat before training, before getting on the bus for match day or even taking 60 seconds before a game to explain clearly to a player what my plan is for him or her in the upcoming game. 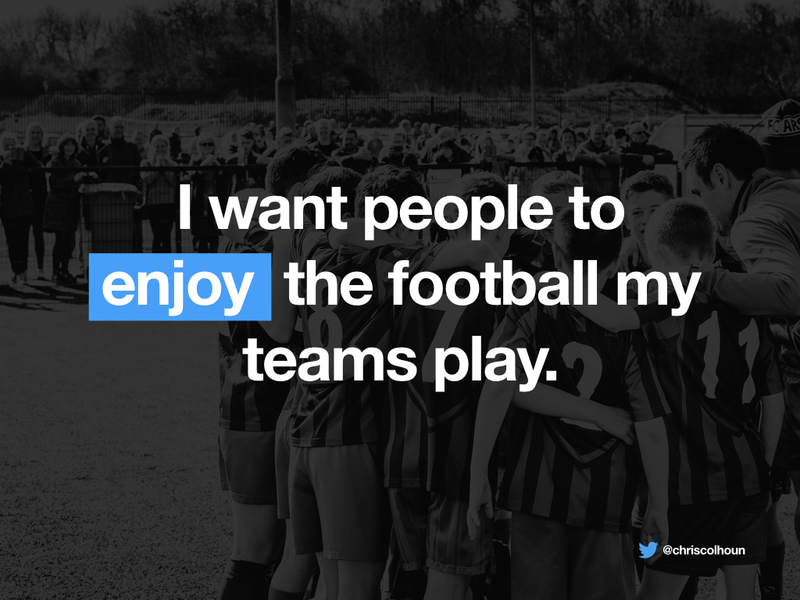 Especially with younger players, those informal chats before a training session helps to give an opportunity to better understand the player, see what teams they are watching and generally to engage in football chat together. This in turn helps give me an idea of the type of football they enjoy and which players they may aspire to be like which contributes to my future planning. Every interaction with a player is equally important and how we handle those opportunities can determine whether players buy in to what you’re trying to do. Our first Webinar this month was with Gérard Jones where we looked at “Communication on the pitch”. One thing which I found interesting about this discussion was creating Game Calls. A common language between coaches and players that relate to your style of play. For example, we would often use the cue “Open up” with our players. They understand that this means to open their body shape and look for width on either side of the pitch. By developing a common language it helps to get your philosophy across and provide clarity for everyone involved. Our second webinar was with the excellent Donna Fishter where we discussed off-field communication. We looked at the concept of “People first”, “Person next” and “Player last”. Donna spoke about how every human being needs Safety, Mattering and Belonging. By getting to know our players as “People first” and taking time to listen to them it helps give them as sense of purpose and self worth within the group. quite simply using their name. “They have to buy into you before they listen to what you teach”. Communication is difficult, it can often include having tough conversations which sometimes are easier to avoid than to deal with. One of the main benefits of the MSC Programme is having a mentor to chat with about your day to day coaching and learning from their experience. I had a great discussion with my mentor Bobby this month about being clear with players about their roles on match day. This is something I have already been able to put into practice and has been well received by players. In addition to the content from the MSC Programme this month I have also been reading The Future Coach by Tom Bates which has tied in nicely with the communication theme. A great read, I would highly recommend it! We’re coming towards to business end of the season so there are plenty of sessions and games to look froward to. Looking forward to getting into our next topic on the programme for March. 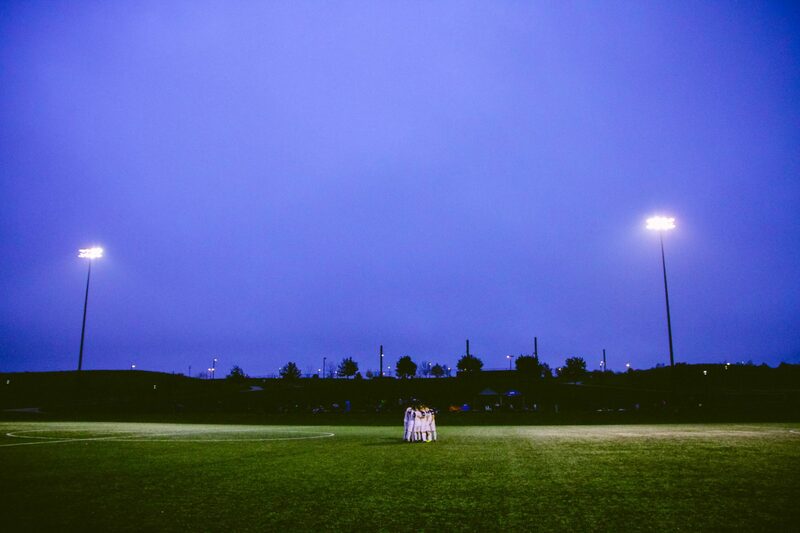 The first task for our Modern Soccer Coach Mentorship Programme is based on defining our Coaching Philosophy. It’s something I have thought about but never taken the time to actually document what sort of coach I want to be and my coaching influences. 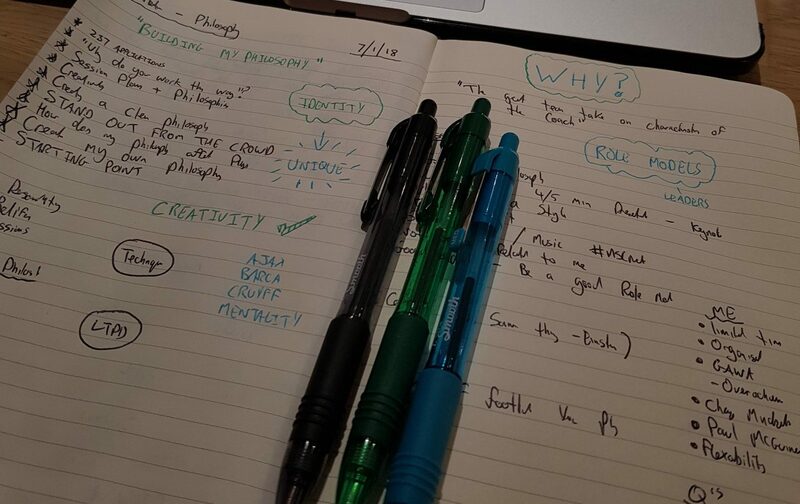 We started with a Webinar on “Designing a Philosophy” with Gary Curneen, the Coach behind the Programme where we discussed how to define a Philosophy and looked at examples. In the first section I have defined who I want to be as a coach, the attributes I want to develop and also look at some of my coaching influences. Within the Style of Play section I look at the teams and players that influence my desired style of play and then break it down to look at how I want my teams to play in possession, out of possession and in transition. 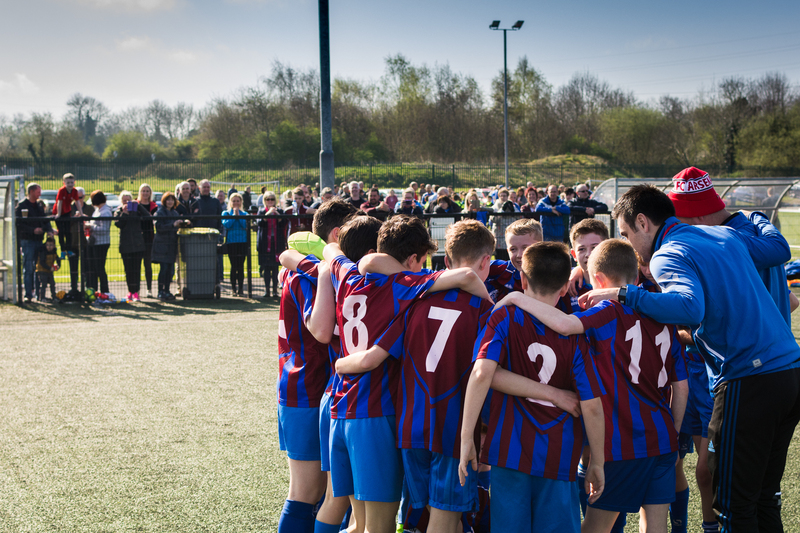 The final part of my Coaching Philosophy looks at Developing Young People. As a Youth Development Coach I feel it is important to think of more than football and encourage good values and respect in the players I coach. The process of defining my Coaching Philosophy has been interesting and enjoyable. While I have always had a good idea of how I want my teams to play, I have never and actually taken the time to document this. I have learnt so much more about my Coaching Philosophy through this process but it has made me realise that while many of my principals will stay the same, my Philosophy will evolve over time. Now I have a starting point and will refer back to it on a regular basis but I will continue to develop my coaching style and with it my overall Coaching Philosophy. Thank you to all the coaches I have spoke to throughout this process. I’ve had a chat with several people based in various parts of the world, many for the first time, and have learnt a lot from our discussions. If anyone would like to chat about my Philosophy or coaching in general please feel free to get me on Twitter or drop me an e-mail. I was delighted this week to find out I have been successful in my application for the 2018 Modern Soccer Coach Mentorship Programme. Modern Soccer Coach Worldwide Mentorship program is an exciting new initiative designed to develop young, ambitious coaches and give them access to elite coaches from a different soccer background, who have experience at the highest level. The program is specifically designed where the mentees will get guidance, support, challenges and have the opportunity to bounce career-related ideas off someone they may not have otherwise met. I have been teamed up with Maryland based coach Bobby Puppione who will be my mentor throughout the program. Bobby is the former Director at Cincinnati United/ CUP and USSF ‘A’ Licence, a highly experienced coach and I’m looking forward to learning from his experience. What does the programme involved? Over the next 6 months I will be working on a 6-month structured programme aimed at providing opportunities to develop my Philosophy and coaching delivery. I’m really excited for the opportunity and I’m looking forward to getting started! This session from the Irish FA Level One Course is excellent for U11+ ages and is a good introduction to the basic principles of defending. The session begins with a 1v1 situation where the defending players aim to delay the attacker as long as possible. We then progress to a 2v2 scenario where the players must develop an understanding of who should press and then the role of the second defender. The session can then be finished with a 4v4 activity where we then look at the roles of the 3rd and 4th defender who provide balance and support. I like to use this session as an introduction to defending principles, depending on the group it can be used as early as U10/U11.This is also an excellent activity to do with older Youth Teams in order to revisit the basic principles of defending. 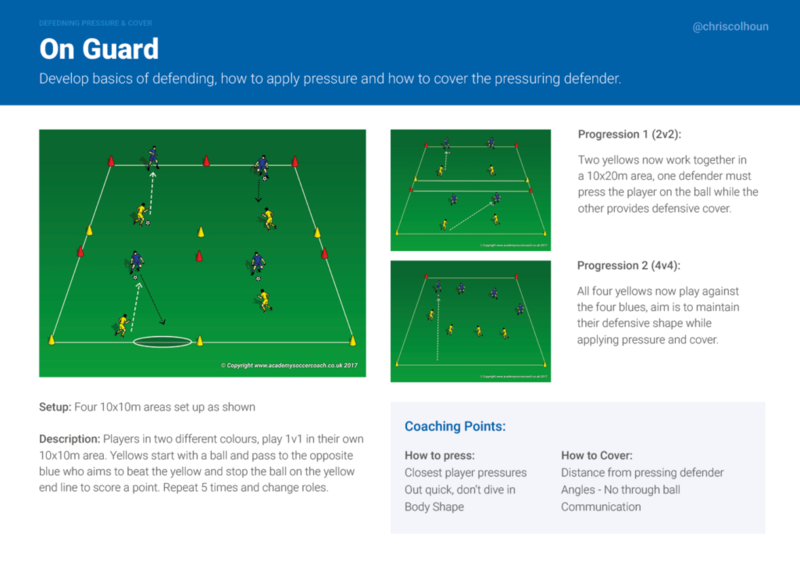 Click on the image at the top of the post for a JPG or if you prefer you can Download the On Guard Defending Session Plan as a PDF. I’ve picked up a couple of great coaching books in 2017. Improving my knowledge of the game is one of the most important things I try to do every week. There is plenty of lessons you can learn from the best coaches in the world and apply to your sessions, even at grassroots level. 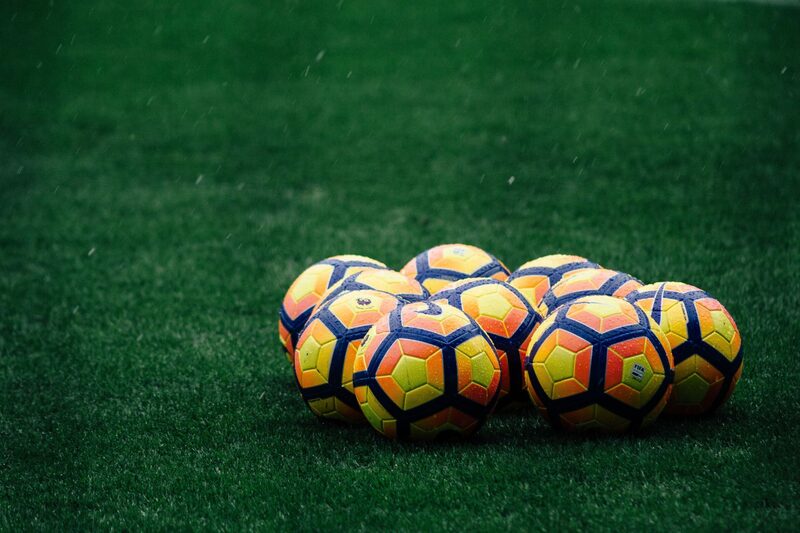 Sportswriter Mike Calvin documents the world of the Academy Setup in England and looks at what it takes to become a professional footballer. In this book Mike looks at how hard it really is to become a professional footballer, what environment awaits the brightest players and paints a frank picture of how many players ultimately forge a career in the game. This is a great concept for a book, football fan turned author Daniel Fieldsend takes a trip around Europe visiting clubs from Lisbon and Bilbao to Amsterdam and Munich. The book looks at how Europe’s best teams educate their young players and looks at the cultures created in order to consistently compete at the top of the European game. Originally released in 2014, I’m regularly going back to this book for my weekly session planning. The book is packed full of really good activities, focusing on everything from warm-ups, transitions, counter-attacking and possession. Omagh native and good friend Gary Curneen has since published follow up books on Position-Specific Training and Pre-Season Training , both also worth a look! The follow up book to Pep Confidential by Marti Perarnau which takes an in-depth look at Pep Guardiola’s tenure at Bayern Munich. Get an insight into Pep’s philosophy and how it has evolved from his time at Barcelona to his career in Bavaria. One of my favourite coaches of the modern game, a great character and a master of the game. Jim McGuiness is currently coaching Football in China with Beijing Sinobo Guoan, he’s come a long way from coaching his Native Donegal to All-Ireland Football success in 2012. In the book Jim gives an account of how he analysed and ultimately neutralised a great Dublin team with an impressive tactical display. It caused some controversy when published but from a coaching point of view there are some excellent stories included. I’ve a few books on my reading list for 2018… if you have any recommendations please send them on! Description: This session is designed to focus on passing technique when under pressure. Throughout the session players should be encouraged to be comfortable in possession, to support the player on the ball and to be communicating at all times. The session will develop to introduce scenarios, the team may be 2-1 ahead and need to see out the final 5 minutes of a game. They should be comfortable in possession on a match day. 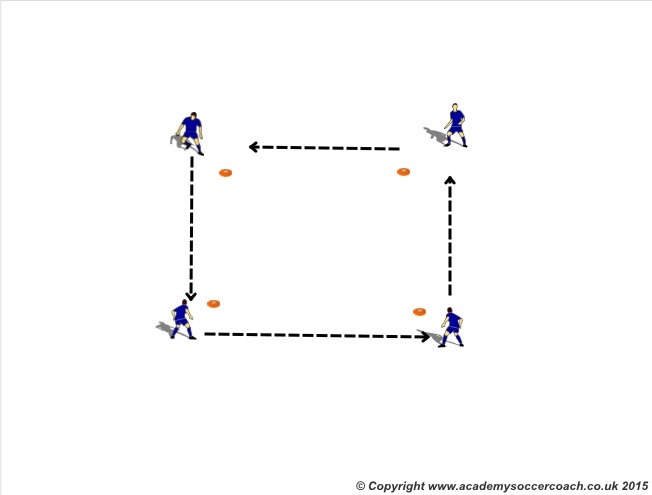 Description: Groups of 5 or more, practice basic passing around a square. Repeat for both feet and progress to introduce combinations if necessary. Description: Within the same passing squares, players form a circle with 1/2 defenders in the middle. Progression from previous activity in order to develop passing technique when under pressure. Rotate defenders with whoever looses the ball. Work for 3 minutes with 2 minutes rest, then work for a second 3 minutes. Description: Teams start in their own 15x15m area, coach starts play by passing into either team. The team without the ball must send 2 defenders in to make a 5v2. Team in possession must keep the ball, 5 passes = 1 goal. If defenders intercept the ball they can transfer the ball without pressure. Team who lost possession then repeats. Description: Session designed to work with a large group of players. Approx 18-21. 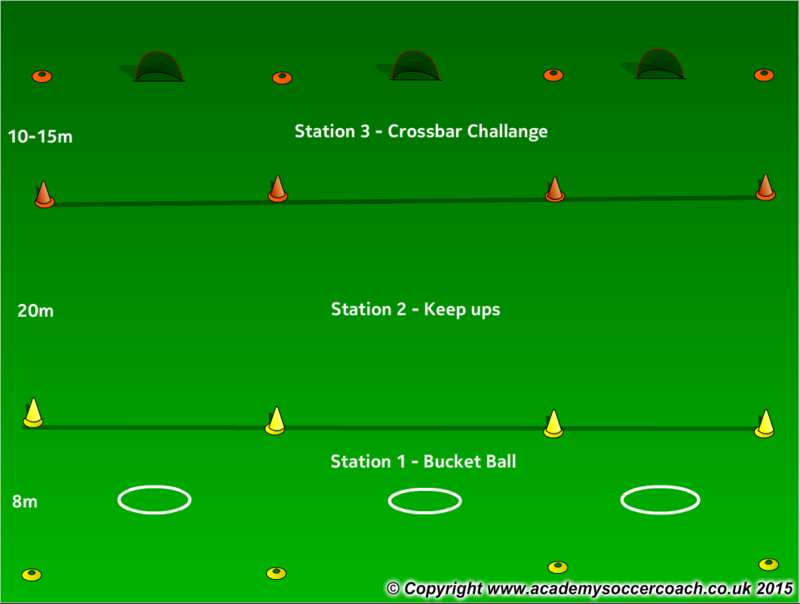 Description: Session to develop understanding of playing out from the back. Session should focus on passing and receiving technique and positioning in and out of possession. Description: Players in groups of 6-8, split up into two even groups facing each other. To begin, simply take a touch to control and pass to opposite player then follow your pass to join the opposite group. 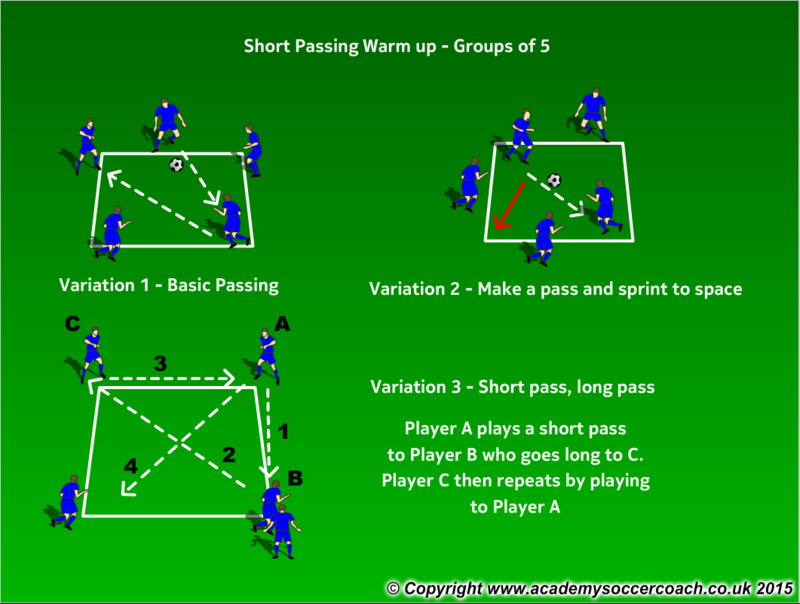 Work for 3 minutes to allow players to warm up. Can add in dynamic stretching by jogging around the cone to your immediate left. Progress to 1 touch when players are comfortable. Description: 7 (plus goalkeeper) v 4 in the main area with 2 target players. Play always starts from the goal keeper, blue’s must spread out and work on their shape for goal kicks. Blue’s aim to get the ball into one of the target players to score a point, target player then switches to the other target who plays back to goal keeper. If red’s gain possession they must aim to score into large goal. Description: Play now switches around and the blue team attack the large goal. 7v6 (plus goalkeeper) game in the main area in favour of the blues, play starts with the blue server (or coach depending on numbers). Blue’s must play from the server to create goal scoring opportunities. Blue’s can play back to server to keep possession. If the red’s regain possession then they must aim to score in either of the small target goals. Throw-ins in play, play restarts from the server. Session to develop passing and receiving technique. We then introduce players to different 4v4 conditioned games where they have to solve different problems. 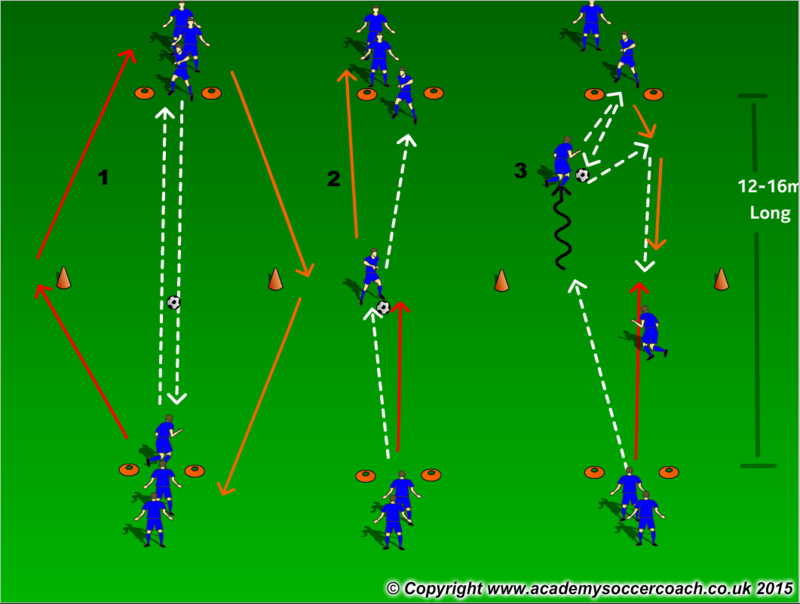 Description: Three variations of short passing, slowly lifting the tempo as the warm up goes on. Players should work on developing passing and receive technique, ideally working with 1 or 2 touches maximum. Description: This game mimics playing against a team that defends high up the pitch, the team in possession must look to beat the offside trap and either drive into the attacking third or receive a well timed pass. Once the attacker breaks into the end zone only 1 defender can follow in to defend. As the players get used to the drill add more pressure or regress as required.